EurOCEAN conferences are major European marine science policy conferences providing a forum for policymakers and strategic planners, both at European and Member State level, to interface with the marine research community and marine and maritime stakeholders. The European Marine Board has been instrumental in organizing the EurOCEAN conferences since EurOCEAN 2000. 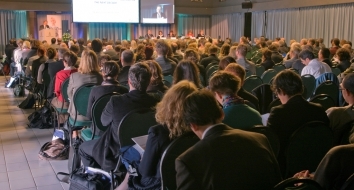 The distinctive feature that characterizes EurOCEAN conferences is the focus on bringing the stakeholders together to speak with one voice towards policy. Since EurOCEAN 2004, conference delegates have delivered joint policy statements, EurOCEAN Declarations, to raise decision makers’ awareness of the marine research priorities and propose concrete actions. These statements have been critical drivers of research and policy developments in Europe since. In 2011, we, in collaboration with the Flanders Marine Institute, launched an overarching EurOCEAN conferences website, www.euroceanconferences.eu. All information and outputs of the EurOCEAN conferences are available on this website. The next EurOCEAN conference will take place on 11-12 June 2019 in Paris, hosted by the Intergovernmental Oceanographic Commission of UNESCO. EurOCEAN 2019 will discuss the contribution of European marine science to the United Nations Decade of Ocean Science for Sustainable Development (2021-2030). The conference will also highlight the contribution of marine science to other ongoing and future initiatives supported by the European Union Framework Programmesfor Research and Innovation, such asHorizon 2020 (2014-2020) and the forthcoming Horizon Europe (2021-2027). The conference is co-organised by European Marine Board, the European Commission and the Intergovernmental Oceanographic Commission of UNESCO. EurOCEAN 2019 conference is recognised as a contribution to the preparatory phase of the UN Decade of Ocean Science for Sustainable Development (2021-2030). More information can be found at EurOCEAN 2019 website. Follow the latest updates on #EurOCEAN2019. The most recent in the series of conferences, EurOCEAN 2014, took place in Rome from 7 to 9 October 2014. EurOCEAN 2014 was an Italian EU Presidency event, co-organized by the Italian National Research Council (CNR), Istituto Nazionale di Oceanografia e Geofisica Sperimentale (OGS) and National Inter-University Consortium for Marine Sciences (CoNISMa), as well as the European Marine Board and the European Commission. Information on EurOCEAN 2014 through the EurOCEAN conference website. You can find the press release for this event here.